This past August our CEO, Daniel Lynton, brought our whole company together in Breckenridge, Colorado for our annual company retreat. Four days of bonding and exploring sites with your co-workers is a great opportunity for a distributed team like ours. Here's a few things we did (and learned) that you may consider doing for your own company. We arrived on a Thursday. Daniel and a few other Lyntonites live in the Denver area so pick ups were coordinated appropriately. We met at Daniel's house where he had prepared a varied grilled feast for all of of us. It was nice to reconnect with everyone face-to-face. We chatted and mingled and company wide awards were announced. Many of us are asked what it's like to work with a distributed team or work remotely. I think our collective answer would be that it's much better. Our internal company processes and technologies assure that everyone connects regularly. We have daily stand-up calls where clients and tasks are discussed, we use Teamwork for project management and Slack for instant communication and Google Hangouts if we need a face-to-face call. We have client calls using GotoMeeting. Being remote allows each of us to be linked to our own geographies and recharge in our own ways. That could be hiking in Colorado, chilling in Austin or rooting for the Cavs in Cleveland. We are all Lynton and we are all individuals. On Friday, our whitewater rafting trip was planned. 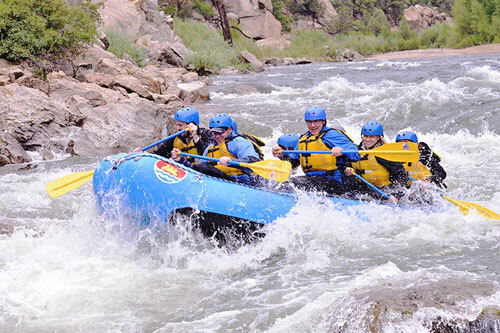 Many of us had never been rafting before and weren't sure what to expect. I mean we surf the web from our desktops, right? This was a whole new experience for us. After the standard whitewater rafting safety talk I think we were even more concerned. They have to tell you the absolute worst things that can happen, of course. When we got to the river, we split up into two rafts. In each raft everyone had a specific role based on where they sat. Our guide told us which way to paddle and what to look out for. We all quickly realized this is was a fantastic analogy to our agency in general - we are in this together, we are all important and we all have varied roles to play. And, just like it was in the raft and it is at work, it's important to stop 'paddling' and enjoy the scenery. On Saturday, Daniel had breakfast ready for us and we went on a group hike. For me personally, I learned that a hike in Colorado is a bit different than a (flat) hike in Cleveland. Oh, and that whole altitude thing. Needless to say, some people were more facile hikers than others. The wonderful thing about the hike was that everyone finished. No one gave up, no one turned back. Everyone pushed through - regardless of how tired they were. For me, that really spoke to our Lynton culture and that we stand by each other and look after one another. The last Lyntonite on our hike didn't finish alone. If you're on a tough project or in front of a client, you're never alone. Our hike really reinforced that for me. Saturday evening, after a group dinner, we all participated in an escape room. We split up into two teams again and worked to solve a murder mystery and unlock our individual teams from our respective rooms. It was another new experience for many of us. It reminded us that we all have to work together to solve a problem and that we all have strength and weaknesses. One person's strength can counteract another person's weakness and vice versa. Most importantly, we all have a singular goal. On Sunday many of us took a final stroll through downtown Breckenridge and said our goodbyes and headed off to the airport. It was a crazyfast and action packed four days. Working together in a non-work environment ultimately helped us work better together as LyntonWeb. And man, how cool is it to have a CEO who understands and values the importance of building a culture with a company-wide retreat. We're all lucky to be Lyntonites.